With the Carrier Dome getting a much needed update (hard roof, Video Scoreboard on a moving track, A/C and Concession Improvements) it follows a growing list of other schools. The linked article lists all the new work being done around D-1. UNC....the chair back replacement. Is there going to be enough leg room? The Razorbacks old stadium will be refurbished. (05-18-2018 09:40 AM)NoDak Wrote: The Razorbacks old stadium will be refurbished. Actually it is the stadium in Little Rock which usually hosts a game each year. BTW, I thought Colorado State's stadium was well done on a cost per seat basis. TCU is adding more suites, loge seats, and club seats to the east side of the stadium. That is where the big money is made. (05-18-2018 04:13 PM)Big Frog II Wrote: TCU is adding more suites and club seats to the east side of the stadium. That is where the big money is made. TCU has come a long way in 15 years...amazing. Been to a few bowl games in Ft Worth before the bulk of the remodel. (05-18-2018 08:30 AM)TexanMark Wrote: UNC....the chair back replacement. Is there going to be enough light room? The triple-high double-wide in the sky at Dowdy-Ficklen Stadium in Greenville, NC has been torn down. AC in the Carrier Dome was needed badly. Played lacrosse there on a hot May day. Ugh. It will make a half empty stadium look more full so can't fault them for that. Certainly they've lowered their national expectations for the program though. It all began in 1998 with a new Chancellor(TCU's President), a new Athletic Director, and a new Football Coach. The results have been amazing. 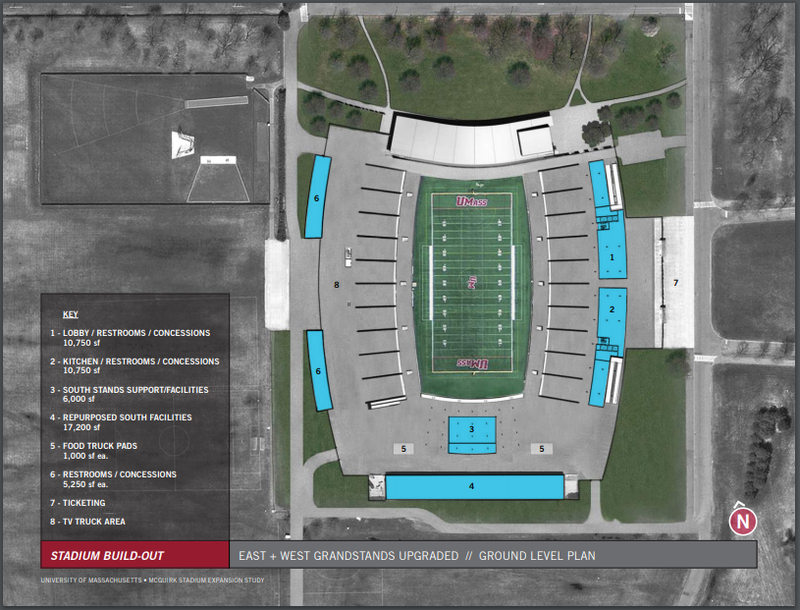 UMass RFP proposals are due by the end of this month with construction beginning in March 2019 and completion by June of 2020 for an IPF Bubble, 20 by 42 foot HD Video board, new shot clocks, and displays on the Performance Center, removal of south wall for fan/visitor hospitality area, ADA upgrades to existing bathrooms, new bathrooms and concession areas, ADA upgrades (hand railings, ramp access, and walkways) to the east side of the stadium, which will pave the way for future expansions in an incremental fashion.